Russia’s Presidential spokesman Dmitry Peskov has confirmed that President Vladimir Putin will arrive in Ankara on the 28th of September to meet with his Turkish counterpart Recep Tayyip Erdogan. The two leaders already spoke over the phone in the aftermath of the Kurdish separatism referendum in northern Iraq, a vote which Kurdish separatists said attained a 91% yes vote. The vote was boycotted by Arabs and Turkomen and widely condemned by the international community. Prior to the controversial vote, Russia, urged Kurds to put the vote on hold in order for the provocative move to be replaced by dialogue. Russia continues to urge for a calm approach to the referendum’s aftermath. “The Russian party believes it to be of utmost importance to avoid anything that risk to further complicate and destabilise the Middle East, which is already overloaded by conflict situations”. The Foreign Ministry added that Russia supports the territorial unity of Iraq and its neighbours and that the present crisis “can and should be resolved with constructive and respectful dialogue aimed at finding a mutual form of coexistence in a unified Iraqi state”. 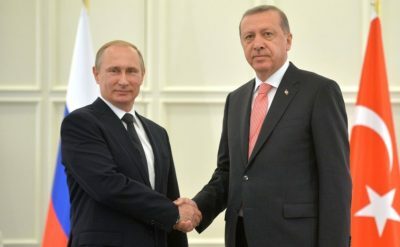 Putin’s visit with Erdogan is expected to cover a cooperative approach to the Kurdish issue in Iraq. Turkey has vowed to implement a strict economic blockade of northern Iraq and has not ruled out full-scale military intervention.